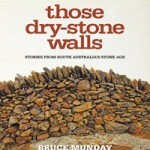 A Stone Upon A Stone is a story about the significant contribution of dry stone walls in the shaping of Australia’s cultural landscape. The aim of the developing the exhibition was to set up processes to try to preserve Australia’s dry stone walls for future generations. 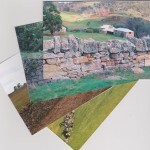 In 1999 and again in late 2000 the Australian Federal Government under its Visions of Australia Cultural Touring Program made possible the opportunity to research and develop a Touring Exhibition designed to capture, promote and affect an awareness of the history and cultural significance of Australia’s dry stone walls. The research and development process initiated and curated by Raelene Marshall resulted in an exhibition that consists of twenty-four narrative panels. Entitled A Stone Upon A Stone it was awarded the best exhibit at the Victorian Community History Awards in 2003. 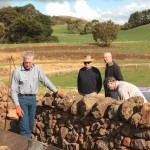 The Dry Stone Walls Association of Australia was formed in Ballarat in July 2002 as a direct outcome of the recommendations Raelene made at the conclusion of the research conducted in Victoria and New South Wales. The process involved meetings and fieldwork with special interest groups, generous farming communities and primary and secondary research in National, State and Local Government instrumentalities. 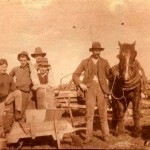 It uncovered written and oral histories, old photographs, Parish maps, farming records and documents, press clippings, poetry and prose, together with stories and documentation about migrant craftsmen from Anglo Celtic and European backgrounds with dry stone walling skills and who settled in Australia in the 1880s. Ballarat, a celebrated goldmining city, is built on a small lava plain with a number of prominent eruption points such as Mt. Buninyong, Smeaton Hill and Mt. Warrenheip. These flows produced an abundance of basalt (bluestone) on and under the surface of the landscape. Sovereign Hill recreates earlier mining days in Ballarat when alluvial deposits below four separate basalt flows were mined to depths of 150 metres. Over 290 tonnes of gold were recovered from the Ballarat mining district. Located within the Baw Baw Shire in west Gippsland, Walhalla is noted as one of Victoria’s richest Gold Mining towns which in its hey day had a population of almost 3500 people. Initially known as ‘Stringers Creek’ the area developed with the discovery of gold in 1862 by Edward Stringer, William McGregor and William Griffiths. Soon afterwards the area was settled by Italian woodcutters, Irish Cornish, Chinese and European migrants…. 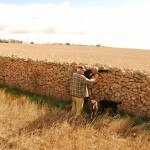 The dry stone walls in the Corangamite Shire form part of an extensive system of walls in south west Victoria which comprise the greatest network of walls in the country. Built by skilled wallers, the walls are distinguished by their function, variety, number, length, height and overall size. Some of the walls in Corangamite are the most technically accomplished, aesthetically pleasing and enduring in the state…. The Greater South West of Victoria appears to be a rather unique region, as evidence suggests that over time, two distinct cultures were adapting to the challenge of this difficult landscape, by using similar materials to assist their survival. The basalt lava flows that resulted from the eruption of Mt Eccles about 27,000 years ago, significantly altered the local landscape, and were a major factor in influencing both Koori and European use of dry stone constructions in the region…. The dry stone walls that exist within the Shire of Moorabool are constructed from surface stones that were once part of the landscape. The landscape varies greatly from basalt plains in the south-east to the timbered slopes of the Great Dividing Range in the north. Volcanic mounts such as Mt Warrenheip and Mt Buninyong are located in the Shire’s west, while the highest point in the east of the shire is Mt Blackwood…. Lava flows from outlets such as Mount Fraser, near Beveridge, sent molten rock to fill old valleys transforming the City of Whittlesea’s landscape west of the Plenty River to become the basalt plain. While only subtle evidence of aboriginal occupancy remains, many basalt or ‘bluestone’ buildings and structures, built by 19th Century European settlers, still survive. These include churches, bridges, farmhouses, stables, barns, milking sheds, dairies and a chequer board network of dry stone walls…. Wyndham is entirely within the Western Plains, which stretch west from Melbourne. Most of the plains are of recent volcanic origin, formed just 2.5 to 5 million years ago, by lava flows bursting from fissures and low lava cones. Green Hill, in the northwest, and Cowie’s Hill, along Tarneit Road, are the most prominent lava cones. The fiery volcanic era left tough basaltic rocks, which litter much of the landscape and line the creeks. They are found in most of the City’s urban and rural areas, and were used by the early European settlers to construct many dry stone walls, bridges, wells and other structures…. Stone is a special resource. The Hepburn Shire is located within a wider area known as Victoria’s central highlands. The landscape of the district is a diverse topography of forests, mountains and plains that are derived from volcanic and marine sedimentary rocks. The varied geology provided the area with a rich collection of goldfields and mineral springs. It also provided two prime sources of construction stone for the early settlers to use, bluestone and freestone…. In the area that is now the City of Hobsons Bay, lava from volcanoes once reached into the sea. The people of the Kulin Nations occupied the land for countless years and rocks featured in their legends and language. Early European settlers quarried and used the volcanic rock for roads, piers, government buildings, ballast (in returning ships) and fences. On the outskirts of Williamstown, farmers cleared the land of timber and boulders. Ploughing the heavy clay soil turned up more rocks and stones and farmers often used these for fences, to separate cows and sheep from crops…. The landscape around Kiama was formed from periodic volcanic flows that laid down beds of latite, a type of basalt. These were inter-laid with layers of sandstone formed from the weathering of the latite deposits. Further weathering generated newer sandstones, which overlaid the old rocks and formed the area’s rolling topography. Later weathering, tremors and moisture exposed the old rock, which broke up into large stones on or near the soil surface. The first Europeans settlers cut and exported timber and cleared the bush to plant crops. With the close of the cedar industry, lands were cleared for agricultural purposes. Ploughing exposed the weathered rock, which was collected and stored in piles on the edges of fields. New, smaller farms created needed fences to define boundaries and keep out stock…. Melton Shire is a municipality of 527 square kilometres, located on the western fringe of Melbourne, with a population of 45,000. The area is characterised by its flat basalt grassy plains and volcanic cones to the south, and rolling, forest covered hills to the north. Melton Shire consists of two main residential areas, Melton, being the main township, and the Melton-East Growth Corridor, forming the western edge of metropolitan Melbourne. The Shire also features the three small villages of Rockbank, Diggers Rest and Toolern Vale. Melton Shire’s rural areas were mostly settled in the mid 1800s for grazing and limited cropping. The grassy plains provided excellent grazing country for sheep, used in wool production, and cattle before their final muster for sale at the Newmarket Saleyards in Melbourne. Dry stone walls were the predominant form of fencing in the area as there was an ample supply of stone on the grassy plains…..